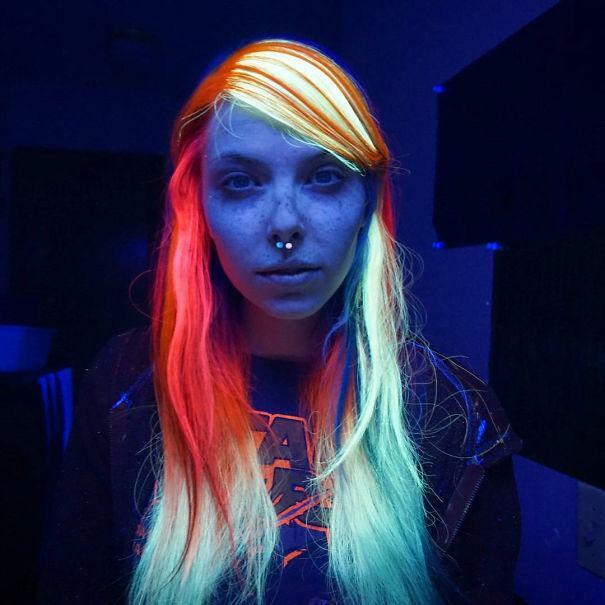 Rainbow glow-in-the-dark hair is a hot 2016 hair trend. Things are getting a little more luminous on the hair front thanks to beauty-obsessives discovering Manic Panic’s glow-in-the-dark hair dye. It’s been around, but this is the first time we’re seeing it mashed up with the can’t-stop-won’t-stop rainbow hair trend. 2016, you’re off to a radiant start. Just last week we checked out the gold-leaf hair trend, and before that we were all about hair tattoos, glitter roots, and even the dude-friendly trend of glitter beards. These days, if you want to make your Lisa Frank-esque rainbow mane glow (or just enjoy the shock factor of those who do! ), you most definitely can. The poster children for this trend are longtime rainbow-haired Megan McCay, who Instagrams at RainbowMegz, and pro makeup artist Mishele DiMaria, who Instagrams at MisheleDiMariaDesigns. Check out some of their snapshots (plus many more!) … and then decide if a few streaks of “Electric Banana” or “Siren’s Song” are what your locks need next. Rainbow Hair at Home? It’s Possible With This Game-Changing Hack! Let Yahoo Makers inspire you every day! Join us on Facebook, Twitter, Instagram, Tumblr, and Pinterest.